The pieces featured on this page comprise only a very small selection from my portfolio. They have all been specifically created for a particular client, whether as a whim, to commemorate a special occasion or to reset clients' own existing stones. Nothing is too big or too small; for further details on commissioning jewellery please get in touch by clicking here. This piece has a special place in my heart. I designed them when I was 16; they were the first piece of jewellery I made when I launched my business and the first piece I sold. They were inspired by the stones and materials of Faberge. The combination of chalcedony and diamonds was one of Faberge's classics and his use of gemstones running over the surface of smooth stones was another signature. Earrings set with chalcedony and diamonds in white gold. The materials and techniques involved were inspired by the work of Faberge. The very initial sketches for the chalcedony and diamond earrings. Work by Faberge showing some of the techniques and materials that inspired my earrings. This piece was not bespoke, but it was a one off… the design was so successful that I sold it straight from the working drawing and did not have a chance to have it properly photographed before I delivered it. But from a design point of view, it is one of the pieces I am most proud of, and one I wanted to share. The inspiration came from a detail in Art Nouveau architecture; the contemporary twist came from setting the sapphires in black gold. The centre was set with rose cut diamonds. ‘Blue Flame’ pendant; inspired by Art Nouveau architecture and set with sapphires and rose cut diamonds in black gold. Shown next to its original working drawing. The various stages in jewellery design, in this case the ‘Blue Flame’ pendant. Seen here, the rough working sketch, matching the stones to the design and the finished piece next to its working drawing. What could be a more romantic title for a set of jewellery than the Constellation set? 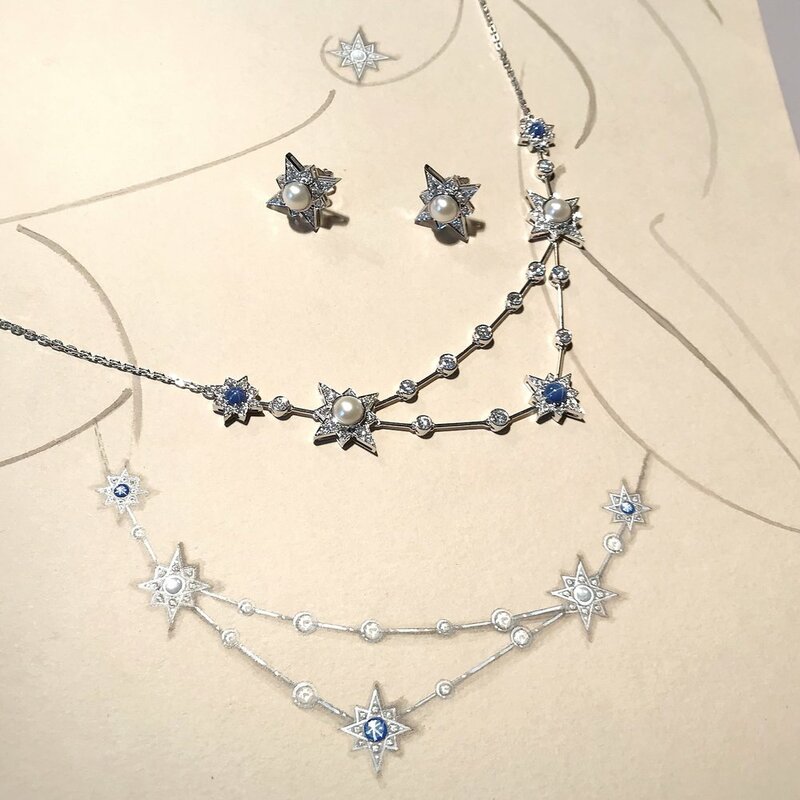 But nothing could be more appropriate… the piece was made by a client for her daughter’s 18th birthday… the pearls, diamonds and star sapphires used where her own, a gift from her deceased father, which she wanted to pass on. One of the given names of the person receiving this is Sky, so the sentimental side of the commission- and by far the most important- was particularly poignant in this creation. The shape of the necklace is based on the zodiac star constellation of the person receiving the gift. Bespoke Constellation necklace set with pearls, star sapphires and diamonds. Created as an 18th birthday present. 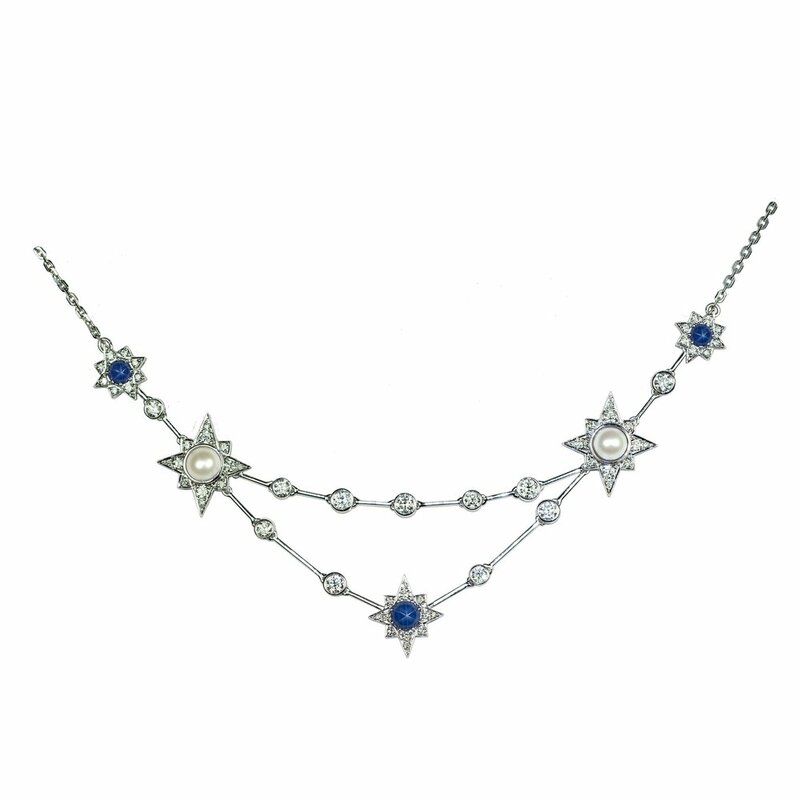 A snapshot of the Constellation necklace set with pearls, diamonds and star sapphires. It is shown with its working drawing in gouache and Chinese ink. To me, when a piece is not symmetrical balance is essential: and a perfect example of balance in my work is this bespoke ring, executed in pink sapphire, amethyst and peridot, set in white gold and diamonds. Bespoke asymmetrical ring in pink sapphire, amethyst and peridot, set in white gold and diamonds. Working jewellery renderings in gouache for the three colour drop ring. These cufflinks were commissioned as a wedding present from the bride to her groom. They were directly inspired by a technique favoured by the great Russian jeweller Peter Carl Faberge, that of overlaying patterns of precious metal over semi precious stones. It is a technique that has inspired many of my pieces and has become a recurring theme in my work. Jade, ruby and gold bespoke cufflinks. Gold and jade cigarette case by Faberge. The technique of overlaying precious metal over the surface of semi precious material has inspired much of my work. Two ring: the same design, different materials. On the left, rubellite and black diamonds, on the right chalcedony and diamonds. Inspired by Faberge. This is a perfect example of how an old stone can be given a new lease of life. The aquamarine itself was badly scratched and restored by my lapidary. The setting was designed in conjunction with the client, who wanted a versatile jewel she could wear day or night. An emerald cut aquamarine and diamond ring with diamond and aquamarine shoulders. The unset aquamarine with the original working drawing. This bespoke piece was created using the client's central stone. The stone is of Indian origin, so the design pays homage to the great Art Deco pieces created in the 1930s by some of the great jewellery houses for the maharajas. An Indian table diamond set in white gold with emeralds and brilliant cut diamonds. Different design concepts can be adapted to suit different stones, as can be seen here with this emerald and diamond pendant. A magnificent emerald and diamond Colombian emerald ring. Each of the emeralds was over two carats. The shoulder stones were specially cut for the setting by master lapidaries in Germany. The Colombian emerald ring shown with its original working drawing. Considering the various design proposals with the two Colombian emeralds. I was asked to design this set to celebrate an important birthday of the recipient. The brief was that above all, the jewellery must reflect the personality of the receiver. Sapphires were her birthstone, so I decided to use the myriad of colours available to fulfil the brief. The range of colours within one stone commemorates the client's creativity and multi faceted personality, and the seemingly random placing of the gems reflects a sense of fun and spontaneity. The set, above all, is versatile, the bracelet and earrings in particular being able to be worn day or night. A necklace composed of multi coloured sapphires and diamonds set in white gold. Detail of the multi coloured sapphire bracelet. Blue, pink and purple sapphire earrings. The multi colour sapphire and diamond bracelet and earrings shown next to their original drawings.